200th Post?? Yes,dear friends..I have reached 200 posts in less than a year,quite a big achievement as far as am concerned since I got my little ones at home and many of the other moms might also agree with me; how difficult is blogging and clicking snaps with kids around.I learnt so many good things after starting off with blogging especially improved culinary skills,experimenting new dishes,improving photography skills and presentation.Above all I have made many good blogger friends whom I haven't met otherwise( virtual friends).Thanx a bunch,friends for being part of this little space.I have another happy news to share with you all.It was my son's birthday last week and he turned five.How fast time flies off ?? I still remember the day(none of the mothers can forget,isn't it?) I received him as a bundle of joy in my arms and I stepped into the world of motherhood,and there were many other first timers as well to join the line-my dad as grand father,my mom as grandmother,my sis as mausi and so on the list goes on as he was the first grandchild of my family !! 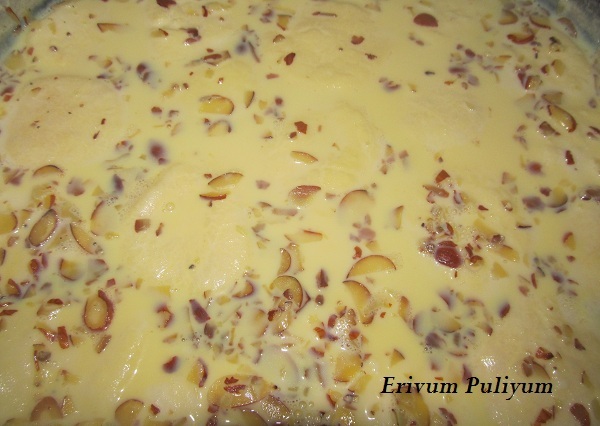 Enough of talks,coming back to today's recipe.My birthday boy doesn't like kheer / payasam but loves sweets. So just prepared these for dessert for the celebration.Rasmalai is an Indian(Bengali) dessert consisting of soft cooked paneer/cottage cheese balls immersed in sweet flavored milk unlike the Rasagullas(you can find the recipe here)which are immersed in sugar syrup.I prepared the homemade paneer and so explaining that process as well.You can use the store brought cottage cheese/paneer too and start off preparing the patties. 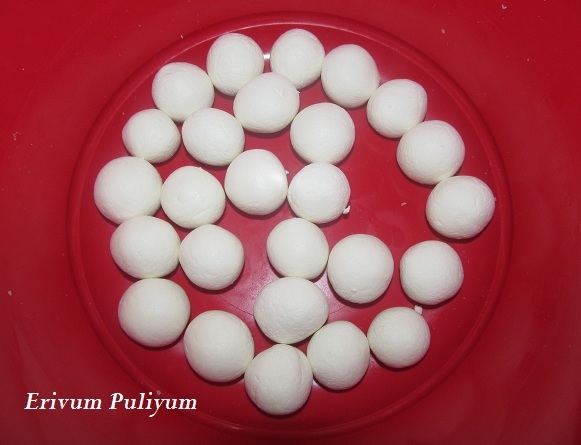 So,friends enjoy the yummy Rasmalai recipe!! -Add in the lemon juice /vinegar slowly when it comes to boil.You will notice the milk fat getting separated from the whey.Simmer for 1-2 minutes and put off flame. -Place a muslin cloth in a colander and pour the contents into it,Squeeze it tight and remove excess water.Place the wrapped paneer under running cold water to remove sourness of vinegar/lemon juice.Squeeze all the water possible in it. -Wrap a kitchen towel over it and start kneading on the towel to make the paneer soft. -Flatten a bit and place it under a heavy pan or cooker. 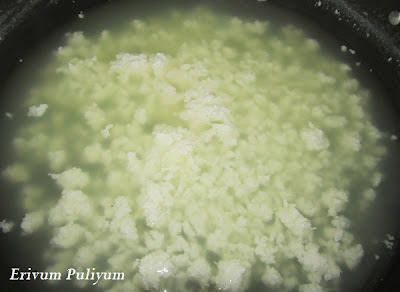 (I filled my cooker with water and placed the paneer under that to give nice pressure. -Divide the dough into 24equal parts and start forming smooth balls.Apple a little pressure in the beginning and then release,smoothen to get the ball. -Place a pressure cooker on medium heat and add sugar and water,bring to a boil. -In the mean time,flatten it into the shape of patties(3/4" thick),leave aside.Repeat the same with other balls. -Once the pressure is released,take out the patties and squeeze them gently to remove excess sugar syrup,keep aside. -Boil the milk in a non stick pan wide enough to accomodate the patties,keep on medium heat and keep stirring to avoid burning of milk at the bottom.Wait till it reduces to 4 cups and thickens. 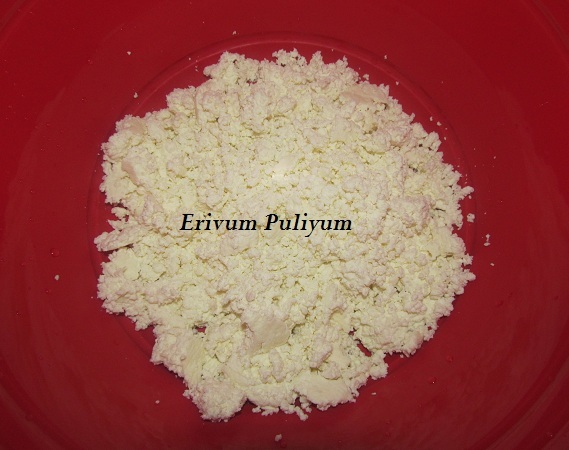 OR If you are using milk powder ,then bring 4 cups of milk to boil and mix the dry milk powder in half a cup of hot milk and stir into the boiling milk. -Add in the sugar and patties.Let it boil for another 5 minutes. 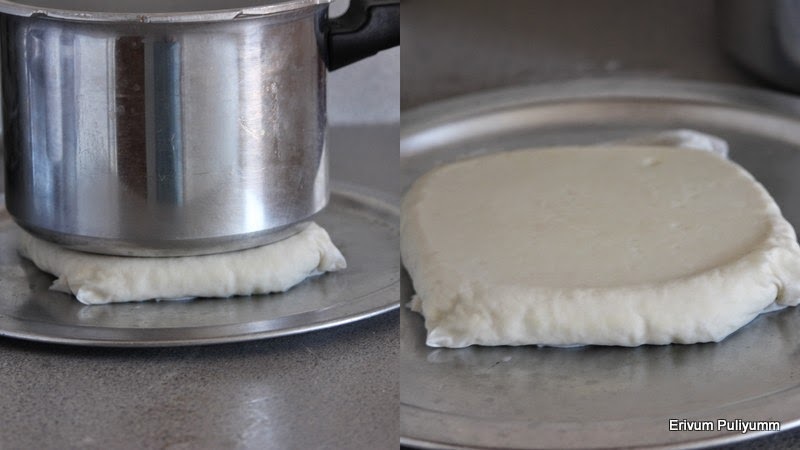 * To check the paneer if its out of required water,take a small amount in the palm,rub for 15-20seconds.Hold it tight to see if it shapes into a ball,then its done. 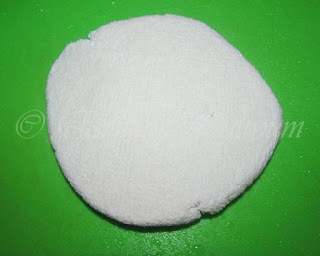 * If you are preparing paneer for other dishes,then ensure you keep it for 2 hours under the weight. *The flavored milk should be thick and not watery. 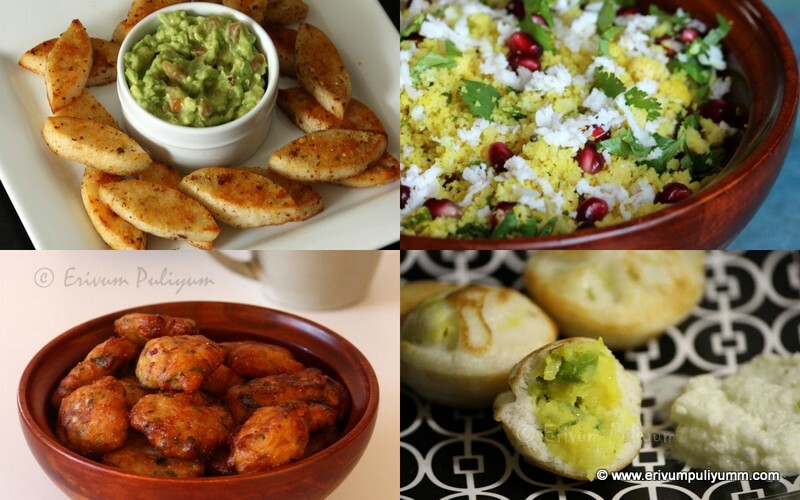 Great recipes and even better personal achievings...Congrats! Superb Julie, nice step-wise instructions, and a very happy birthday to your little one..
@Nish Thanx for the wishes,Nish!! It is a malayalam word meaning spicy n sour as those are my favorite flavors!! Congrats dear on your 200th post!! 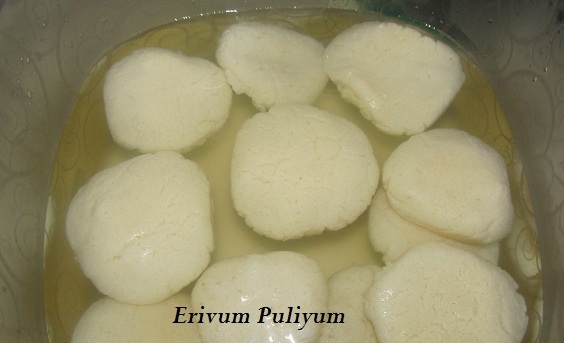 !Keep Rocking...Rasmalai looks so delicious..
Congrats on the 200th post. It is a lot of work to blog 200 posts in a year. When is your sons birthday. My daughter's was last week too. The rasmalai looks good. Good job on the step by step presentation. 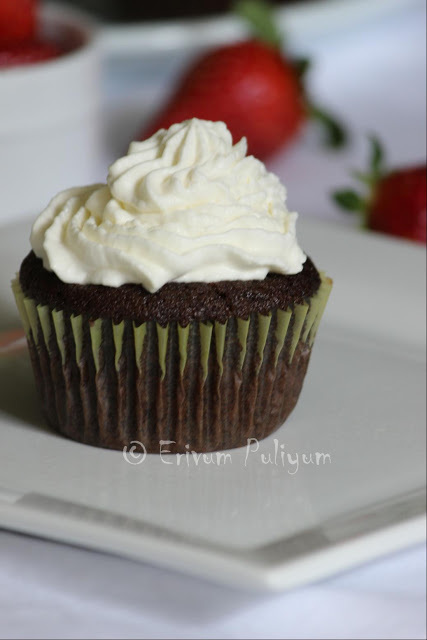 Congrats.Thanks for sharing the yummy recipe.Looks Awesome. 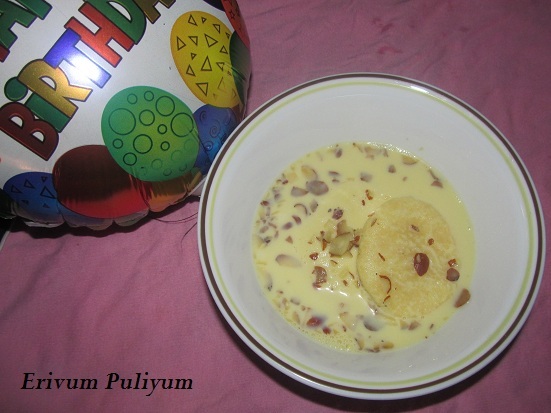 wow!ras malai at home..really nice!...a very happy birthday to your son.god bless! love the meaning of your blog !! 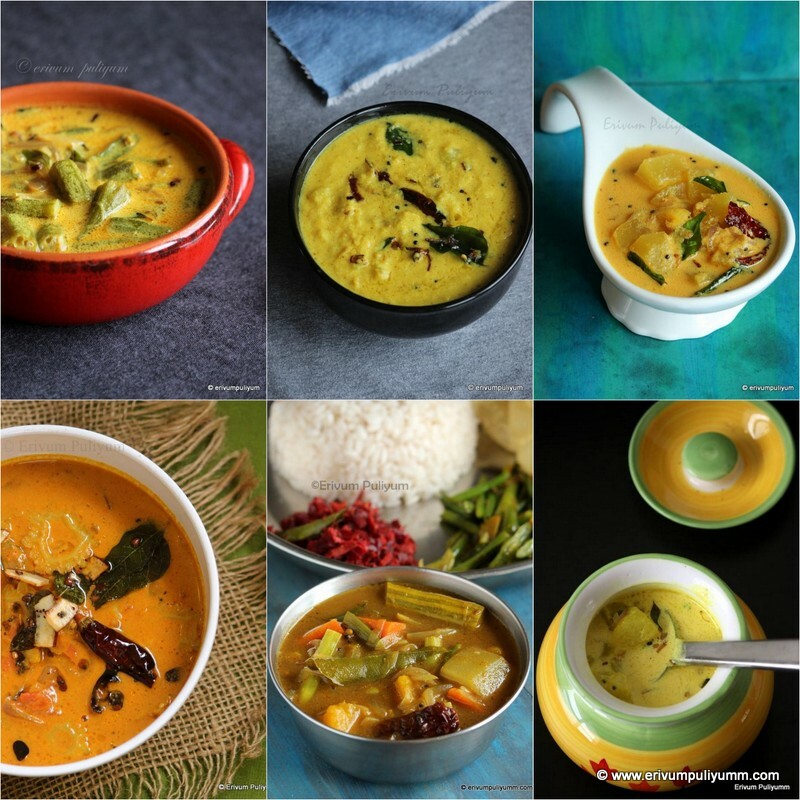 love the step by step pix of rasmalai ! Happy birthday to your son !! Cheers on your super 200th post Julie..That's a superb recipe to post for the occasion..Keep rocking! Congratulations on the 200th post. And nice name you have chosen. Congrats on ur milestone, great going Julie, may u achieve new milestones soon :) Appreciate ur hardwork with blogging !! Belated b'day wishes to dear "T". Hope he enjoyed his day :) Can't believe years are passing by so soon..:) May God bless him, wishes from all of us and may he achieve success and happiness in all his endeavours :) luv n hugs to him !! btw, Rasmalai is looking very yum...tempting n superb !! Congrats Dear Julie. 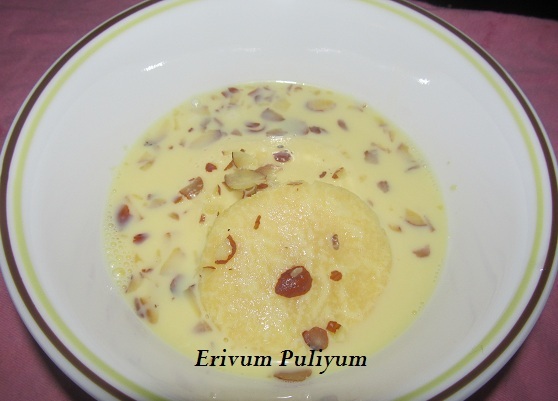 Luvly Rasmalai recipe Dear. A worth-trying recipe. Belated birthday wishes to your son. Congrats and more to come.. Now i just know what blog meaning.spicy and sour, both i also like,hehehe..
Good job and keep going... I love love Rasmalai..
Congrats on your 200th post! Congrats Julie, great going gal!!!!!! Wishing you many more achievements in life. Congrats on 200th post, Julie..hoping to see many more from you. Superb pictures and great effort in making this dessert..
Congrats on your 200th post!Wow what an achievement!Even more commendable when you have little kids like I do :)Love this rasmalai recipe.Great step-by-step tutorial! congrats julie on ur 200th post... and a belated happy birthday to ur son. CONGRATS JULIE,You did it!!!! wish you all success for blogging. Rasmalai looks excellent and yummy. Belated Bthday wishes to Tuttu..
HI JULIE...CONGRATS ON YOUR #200..
imagine you already know how to cook more than 200 recipes... that's the great thing about blogging huh..
i also get to learn a lot from you, today's post is very interesting, taught in very great details..never tried this before.. now its easier to follow the process of making paneer. Congrats on your 200th post and wish you tons more to come. Thx for linking this yummy dessert to the event. Thanx all guys for your wishes, will surely add on my recipe book:)) & Thanx for the birthday wishes too..
Congratulations Julie! Love your rasmalai, It's one of my fav sweets. Thanks for linking up to my event. rasmalai my favourite sweet :) congrats on the milestone :) keep going! Congarts on your 200th post! Hope u never have your last post! I ve never tried anything like these - its not known here - but looks really interesting! Congrats on your 200th post Julie. Lovely looking rasmalai making me drool here.